Scientists at Universidad Carlos III de Madrid (UC3M) have analyzed the process of nitrogen fixation by cyanobacteria, creating a mathematical model which allows to understand the patterns they form. 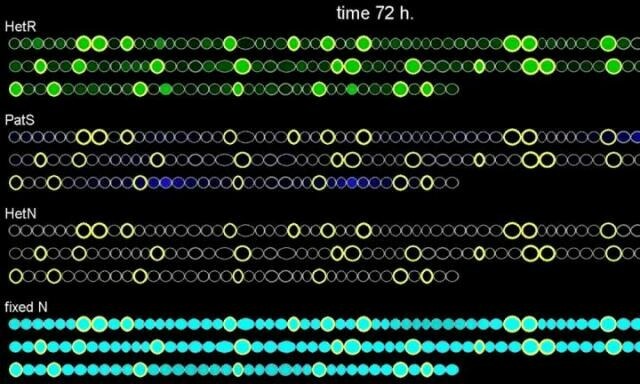 In these patterns, approximately one out of ten cells in cyanobacteria filaments fixes nitrogen, while the remaining nine carry out photosynthesis. These microorganisms are fundamental to life on Earth because they produce much of the oxygen in our planet, and convert nitrogen into chemical forms which can be used by any life form. This work, which has recently been published, along with Javier Muñoz-García, in the journal PNAS (Proceedings of the National Academy of Sciences), focuses on the process of nitrogen fixation by cyanobacteria of the genus Anabaena, in which cells live sticking to each other forming a filament. When there is enough nitrogen in the environment, all the cells in the filament perform photosynthesis. However, in conditions of fixed nitrogen deprivation, about one in every ten cells - distributed fairly regularly throughout the filament - diversify into a distinct cell type called heterocyst. Heterocysts are not able to perform photosynthesis, but instead fix nitrogen and share fixed nitrogen with the rest of the filament’s cells. Saúl Ares, who has developed this line of research at UC3M’s Department of Mathematics explains: "We have used what is known about the genetics of the process to create a mathematical model for the formation and maintenance of the heterocyst pattern". He goes on to say, "Our theory reproduces the experimental observations and has allowed us to predict a new kind of mechanism, not proposed until now, which should play a role in the maintenance of the pattern". One of the most surprising aspects of the research emphasized by the researchers is the regularity in the pattern formed by cyanobacteria. "These bacteria are able to ‘count to ten': one in every ten fixes nitrogen, leaving a gap of nine, and then the tenth one again fixes nitrogen”, says Ares. Until now, ideas relative to the formation of this pattern were only qualitative and their consistency had not been proven. "By making a mathematical model, we have been able to prove that these ideas work, but we have also seen that the process is not completely explained, because actually a new mechanism is needed: the nitrogen which produces the cells is playing a role”, says the researcher.